The Leather iPhone Wallet is a trifold design meant to carry a couple of credit cards and your phone in a very simple manner. Using only one solid brass rivet, this could be the most minimal way to carry your iPhone. Slip it into most pants pockets or your bag. Made for all iPhone sizes from the iPhone 6 and up. 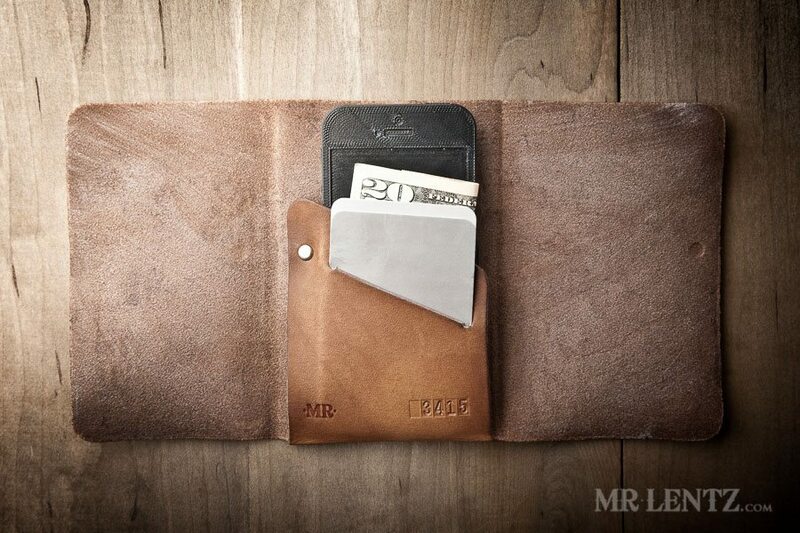 All Leather iPhone Wallets will easily fit 2 cards. Please note that these wallets have been designed down to the millimeter, so initially they will be a tight fit. Give your new iPhone wallet a week to wear in and soften up. Designed to fit iPhones without a case, or with a slim case. iPhone 6 Plus and iPhone 7 Plus: measures approximately 4 x 6.75 inches (102mm x 171mm) when folded.